It’s always fun getting to work with some of the other Go To Team crews and getting to share ideas and expertise. I had the chance to work with with our crews all the way from Miami and Charleston on a feature in Madison, Wisconsin as well as our D.C. crew and Nashville crew in Cincinnati, Ohio. 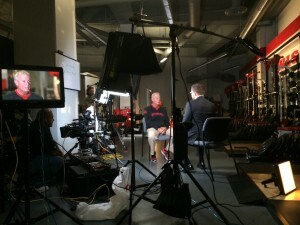 Our Madison shoot featured a 3 camera sit down interview with the University of Wisconsin Men’s Basketball Head Coach Bo Ryan. We shot entirely on the Sony F55 with Canon lenses and used our MYT slider for the wide shot. We set up in the weight room and took advantage of the UW logos on a lot of the exercise equipment as nice background elements. Charleston DP Dave Baker was A Cam and he set to work lighting our background and framing up the tight shots. Miami DP Juan Lopez, meanwhile, set to work on his slider shot while I focused on lighting our subjects. 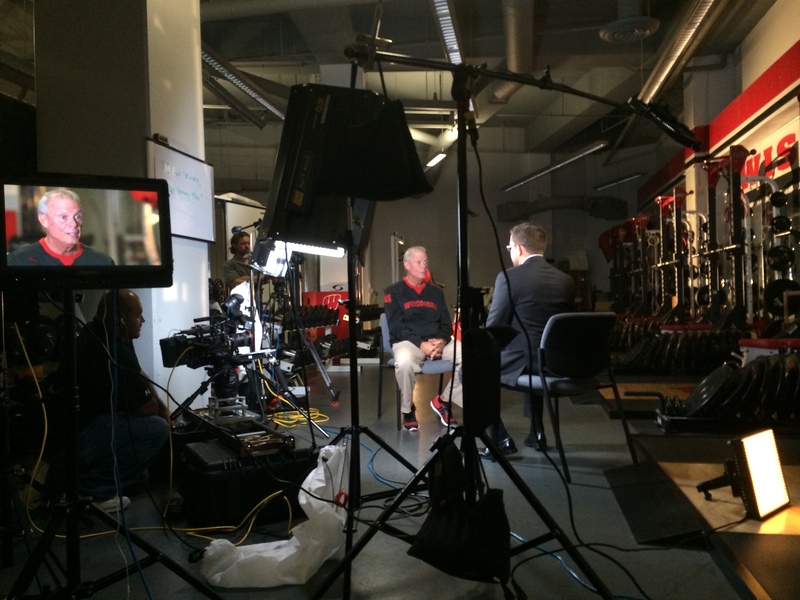 We interviewed Bo for 20 minutes and then Dave and I captured B-Roll of the interior of the arena while Juan got some nice exteriors. We packed up, grabbed some deep-fried cheese curds, and I headed back home to Chicago! 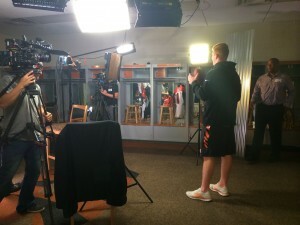 My next assignment for Fox was to head to Cincinnati, Ohio to work with Nashville DP Craig Goodale and D.C. DP Ryan Ricker on an interview with Andy Dalton and Donovan McKnabb. This time we also shot on the Sony F55 but also recorded to a Pix 240 to provide the client with Apple Pro Res. The interview and B-Roll we shot on that Thursday was going to air the following Friday night following playoff baseball on Fox Sports One! Our setup in one of the Bengals locker rooms was pretty elaborate and included bringing in some aluminum siding to create a nice reflective background that could be positioned and lit however we chose. Once again we were using the MYT slider for the third camera on the wide shot and chose to hang some lights from the ceiling in order to keep them clear of the wide shot. 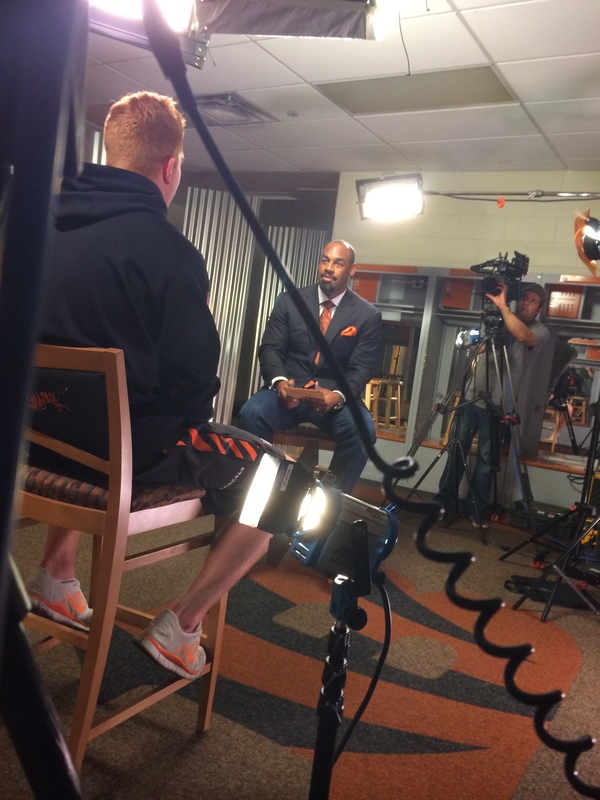 Donovan McKnabb sat down with Andy Dalton for about 15-20 minutes and then we shot some hero shots with Andy before he headed to practice. Craig and I stayed behind to shoot B-Roll of Andy and A.J. Green warming up at practice. We then shipped the footage off to Los Angeles where it was edited and ready for TV the next night!